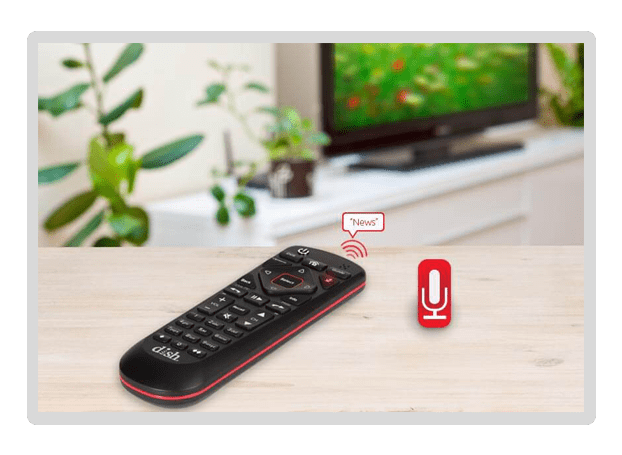 DISH Voice Remote | Control Your TV With Your Voice! Change the way you watch TV with the new DISH Voice Remote! Tell our voice remote what you want and it’s on. Search Live TV, On Demand & Netflix. Command Your TV With Your Voice! Quickly surf TV channels or find your favorite shows all by simply speaking to the new DISH Voice Remote. 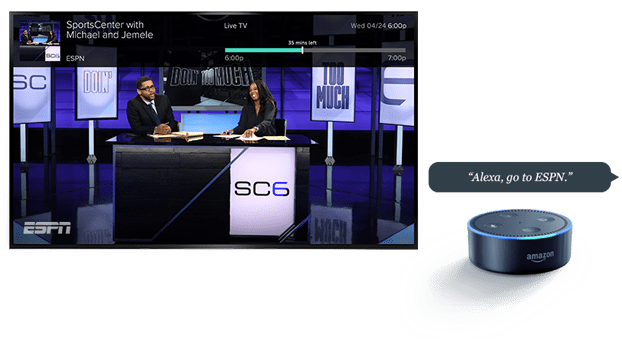 * The remote features advanced voice recognition technology that lets you search live TV, On demand TV, and even Netflix at the same time. Simply hold the button to enable voice recognition and speak the commands for an easier TV experience. “Say ‘hello’ to my little friend! Weather taking advantage of the new voice features, or taking matters into your own hands, the DISH Voice Remote delivers. 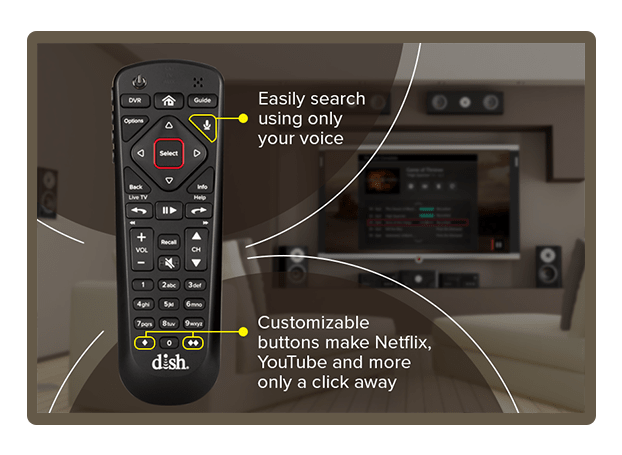 With a new, simplified layout layout, and customizable buttons that allow you to create your own personalized experience, the DISH Voice remote lets you navigate with ease. Its simplified design sports chrome highlights and red striping while offering a total of 32 buttons on the top and 4 on the sides. Do you love turning on the lights to use your remote when its dark? We don’t either! 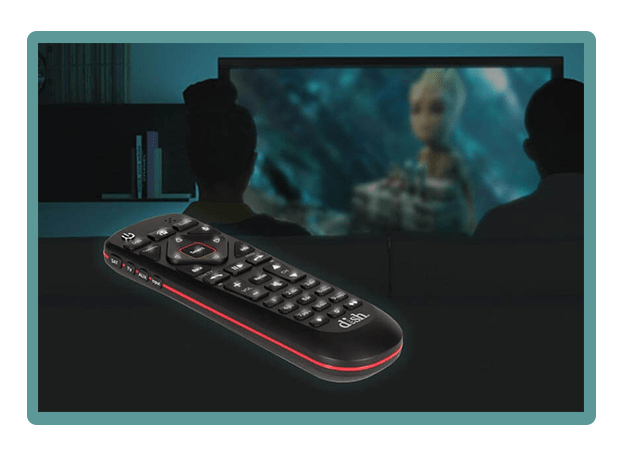 The DISH Voice Remote features backlit buttons that let you see your remote and perform a task in the middle of a dark lit room. Don’t ruin movie night by turning on the lights just because you need to rewind 30-seconds. How often do you find yourself looking for a lost or misplaced TV remote? We can answer that for you! The average American spends 2 weeks of their life looking for their lost remote – but that doesn’t have to be you! 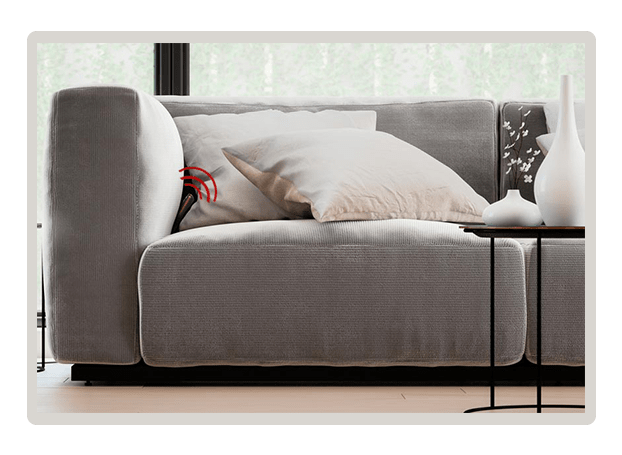 The new remote features a “locate remote” function that, when activated, causes the remote control to emit audible noises and flashing lights. Spend more time watching what you want and save the headache with the DISH Voice Remote. 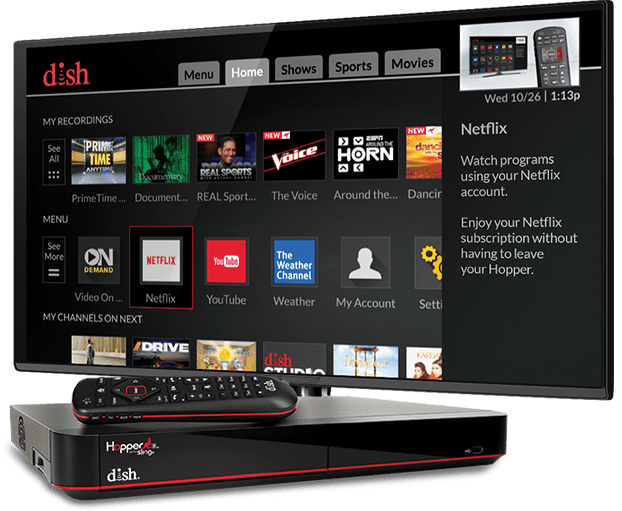 DISH gives you even more control of your TV by partnering with Amazon Alexa and Google Assistant devices. Just link your Amazon Echo, Tap, Show ,Echo Dot, or Google Assistant to your Hopper 3 and use your voice to change the channel; search your Hopper by show or movie title, actor or genre; control your DVR; pause, stop, fast-forward, rewind, and skip; plus more features are on the way!